There’s a beautiful afghan in my Mom’s living room that is referred to as the “20 year blanket” because that’s how long it took her to finish. This is my great white whale, the 10 year quilt. I promised Tim I’d have it finished in 10. I started it last Fall so that’s one year down, nine to go! The pattern is grandma’s flower garden and the method I’m using is paper piecing. I cut out each hexagon of fabric, sew it to paper, sew the pieces together and then remove the paper. When I’m done piecing it together I’m going to hand quilt it. Maybe 10 years isn’t enough! Very time consuming, but it is the relaxing, do it while watching tv kind of crafting, like knitting. I love all the different varieties of the grandma’s flower garden design. 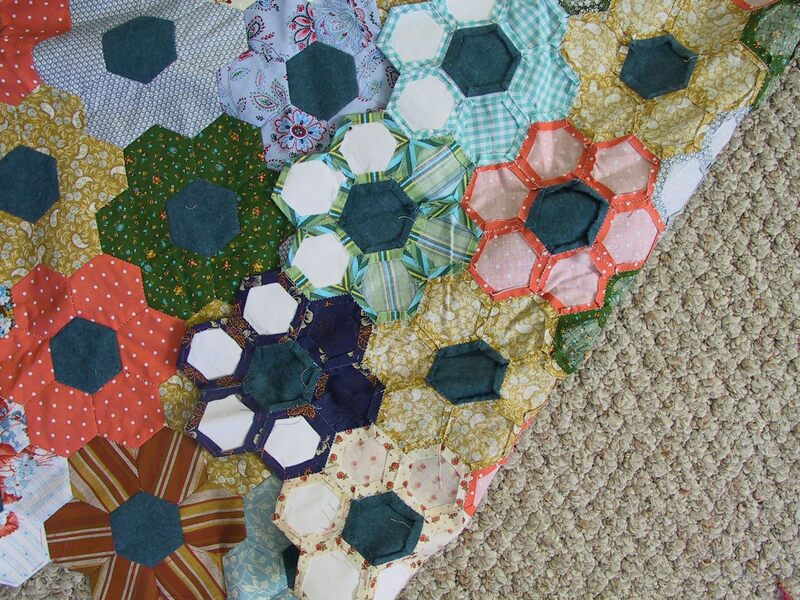 I’m often tempted to cut all my fabric scraps into little hexagons and just commit to that design for the rest of my life. But I know I’m a fickle pickle so I stop myself. Love the quilt and your blog. Alot of inspiration going on here. The quilt is gorgeous. You’re right about the grandma’s garden pattern: it does offer a lot of diversity. I found your blog through poise.cc – I’m glad I did. I LOVE the fabric that you’re using for this quilt! I think it’s great when people take an old fashoned pattern and use funky fabrics to make quilts look modern. It’s really looking neat, even if it does take you ten years to finish! I found your site while looking for a quilt pattern. 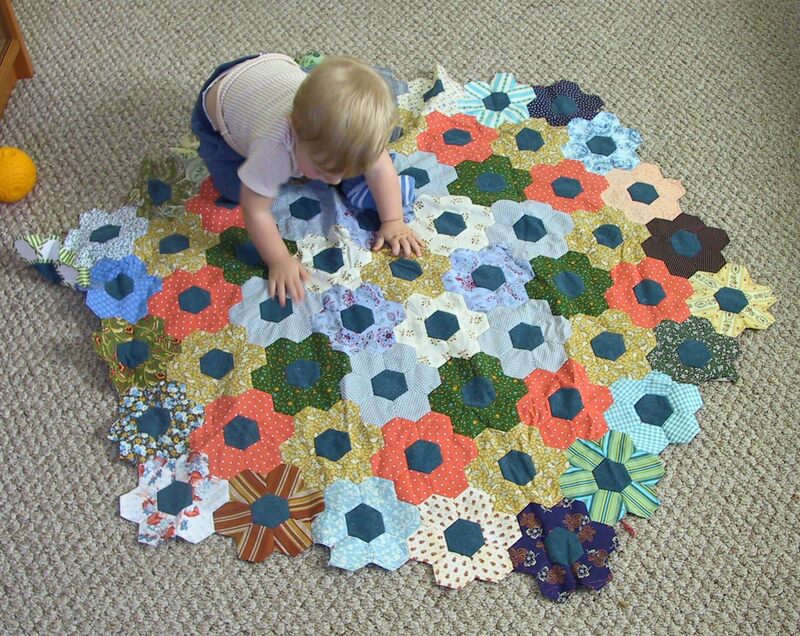 I just love the grandmothers garden quilt you are making. Can you tell me what size hex. you use? I am a beginner quilter and think I can do this pattern. I think lots of people have one of these unfinished. My Gran took about 15 years to finish hers. My auntie now has the quilt but I got all the leftover hexagons! They look like soccer balls! I love so much your blog and this quilt !!! Thank you !!! Ten years is fine…I recently finished a hand-finished puff-patchwork quilt that my mother started in 1980 🙂 And the sense of achievement was enormous. Hang on in there…it’s worth the effort!